Friday for lunch I headed to the Byward Market to try out Continental Bagel in the Byward Market Square building (55 Byward Market Square, Ottawa). It was 11:00 a.m and one customer was just leaving after having their order prepared at a Subway sandwich shop counter like set up. Another customer in front of me was putting in their order which, ironically, was the same as what I was going to order. In the background was another employee working at a wood fired oven carefully rolling, placing and inserting the bagels into the oven on long wooden planks to bake. The whole restaurant set up looked like a Kettleman's Bagel set up fined tuned to fit into the historic Byward Market Square building. I waited patiently for the single server to ring up the previous customer's purchase, slowly put the bagel sandwich together. I almost considered going elsewhere to grab a bite as I watched the previous customer's order come together slightly faster than a snails pace. But eventually everything was wrapped up and, knife polished and I was ready to order. The Order: 1 Turkey Sandwich (lettuce, tomato, deli sliced turkey, etc.) on a Poppy seed bagel. $6.75 including taxes. The server punched in my order, I paid, and he proceeded to put together my order at the sandwich bar. First grabbing a poppy seed bagel from the glass front display, cutting it and then going from container to container of ingredients. Nothing fresh looking about any of the ingredients. In fact, I wouldn't be surprised if, like subway ingredients, they come presliced in a package from some warehouse and placed in the containers then brought and inserted into the sandwich bar. After the sandwich was completed and placed in the container, the server then went onto wipe his knife and the sandwich bar before then handing me my sandwich. 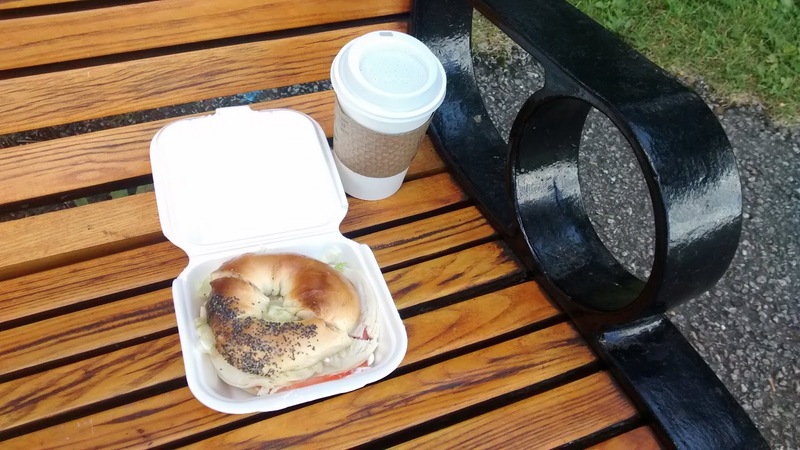 Next, I headed over to Maple Valley Tea World for a Peppermint Tea before finally landing in Major's Hill Park for a fabulous lunch outdoors while being overlooked by Ottawa's Parliament Buildings. The bagel sandwich was average. A slightly hardened crust outside gave way to an average tough inside similar to any store bought bagel. Nothing really fresh about this, perhaps the bagel I had a was mere day old. The toppings, as expected, weren't that special at all in freshness. But to be fair, the bagel bakery is meant for fresh bagels and not fresh lettuce, tomatoes or toppings. But at six dollars and change with tax I had expected a little more than an average bagel put together like fast food subway sandwich. Overall, an average nothing special sandwich. Was it decent? Yes, but is it the best food offering in that building let alone the Byward Market? Nope, far from it. This place will be fine for the picky eaters under the age of eighteen looking for something to eat while Mom and Dad enjoy better quality food from elsewhere along with the ambiance of the market.